For most people I know, the Donald Trump presidency has been a bigger nightmare than they had feared. One of the things that has helped people cope is the brilliant comedy that shines a light on the sometimes downright cruel things Trump has done. 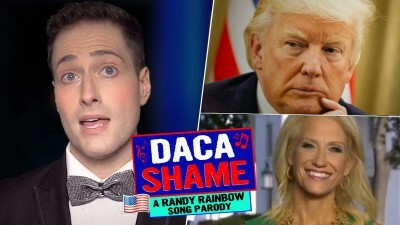 Here is Randy Rainbow’s latest video Daca-Shame which re-imagines Wayne Newton’s classic song to take Trump to task for the shameful plan to terminate the Deferred Action for Childhood Arrivals (DACA) program.